+ Insert food in 10 seconds! + Find the nutrition facts! + Find the chemicals (e.g. persistent organic pollutants)! 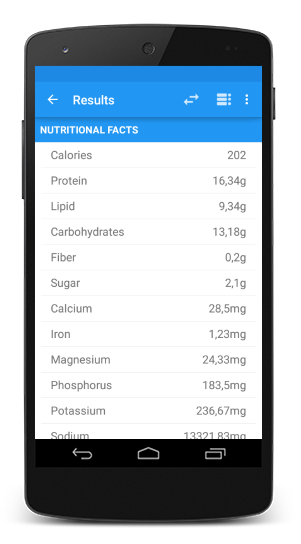 Food Scanner is a first-of-a-kind food analyzer offering valuable information such as nutrition facts, allergens and chemicals, about foods using ordinary smartphones. Food Scanner has been developed by researchers and students at the Data Management Systems Laboratory (DMSL), Department of Computer Science at the University of Cyprus. To get a quote on how to enable advanced analyze your food drop us a line here or at foodscanner@cs.ucy.ac.cy. Food Scanner is open source under an MIT licence. Food Scanner can be downloaded on Food Scanner on Github. To contribute to Food Scanner development post your "Issue" or "Pull Request" on Github. Use Food Scanner to analyze your food in a few clicks! Just photograph the ingredients of your food or photograph the barcode, and you will get the nutrition facts, the allergens and the chemicals.